Welcome to another review in the PIN (Play It NOW) series. 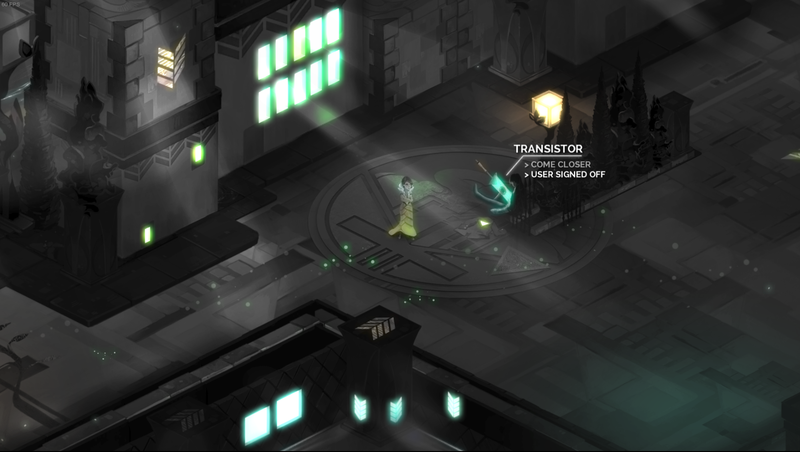 This time we’re taking a look at Supergiant Games’ second title, Transistor. This stylish game is a unique mix of action, RPG and tactics, set in the future during the outbreak and subsequent onslaught of a man-made enemy known as The Process. You play as Red, Cloudbank’s most famous singer, but whose voice is stolen by the evil Camerata, a clan consisting of four powerful individuals: Grant and Asher Kendrell, Sybil Reisz, and Royce Bracket. 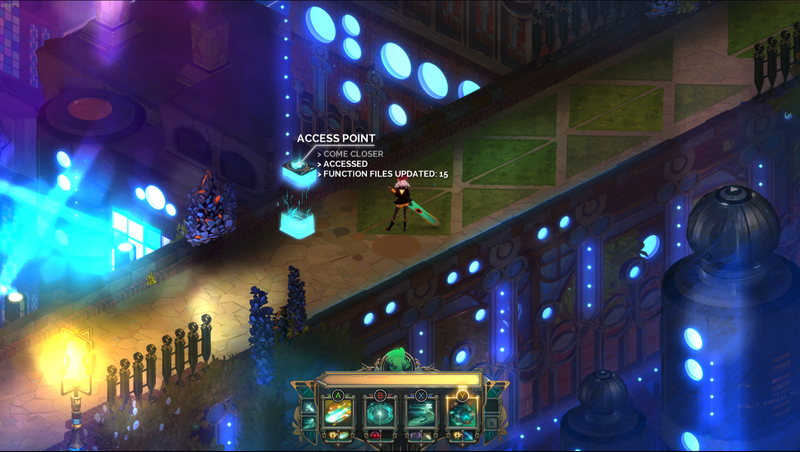 As for the Transistor itself, in the confusion caused by the Camerata stealing Red’s voice, Red escapes with it, complete with her boyfriend’s consciousness embedded within, and so sets off a chain reaction of events which lead to the opening scene in the game and your first glimpse at what the Transistor is capable of in your hands. 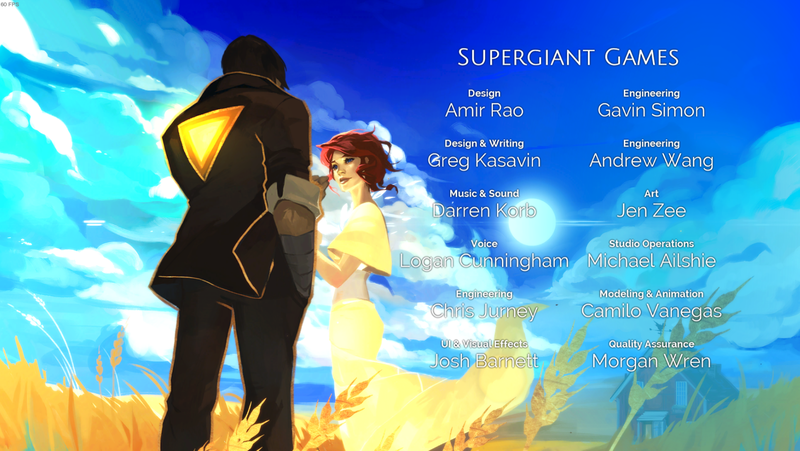 Supergiant was created in 2009 by co-founders Amir Rao and Gavin Simpson. The team is now 12 strong including those original co-founders. 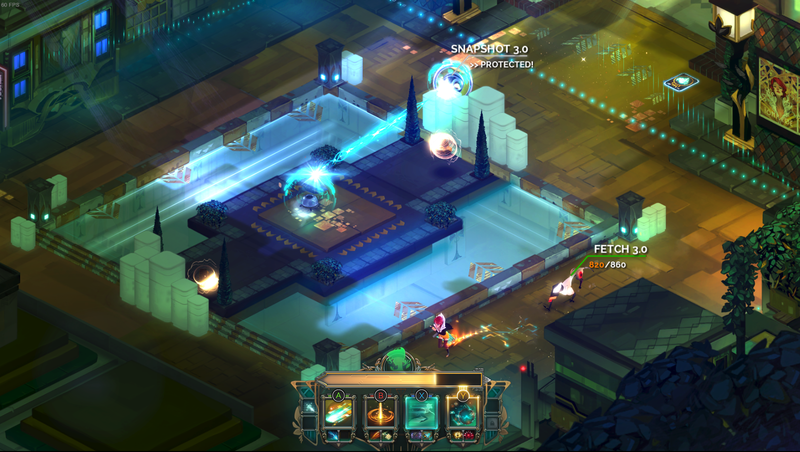 In addition to their more recent and third release, Pyre, Supergiant Games are possibly best known for their first release, the isometric action game, Bastion, which featured arguably some of the best voice acting to appear in any game. True to form, the voice acting in Transistor is also first-class, and like Bastion, fully integrated into the game itself, only rarely using a cut-scene to further the plot. I was gobsmacked to learn that Logan Cunningham voiced both the Bastion narrator and the Transistor. The voice style between the two is very different, so I was convinced that separate actors had been used. Oddly enough, the game allows you to cut some of the exposition short, but I heartily recommend allowing the game to play out in full - there are some great scenes that I missed first time around in Transistor because I was in a hurry to get to the next fight! So, how does it work? You move around an isometric playing field to explore Cloudbank, collect “Trace”, which are the electronic ghosts of people murdered by The Process, and incorporate those as Functions to enhance the Transistor’s capabilities. As you explore, the plot will unfold, either through voiceover by the Transistor, or through vid-terminals where you can view the news and take part in surveys. And of course, periodically, you’ll face The Process, in a series of escalating battles which will test your use of the Transistor throughout. Battlefields are seamlessly integrated with your exploration, but they do impose limits/barriers to prevent you exploiting the map to trivally dodge fights. The Transistor has four base slots available, into which you place Functions which can be activated at any time by pressing the corresponding gamepad button or keyboard shortcut. There’s no MOBA-style cooldown, but some Functions have a wind-up animation before they trigger, so timing is often crucial, if you’re used to simply mashing buttons. As usual, I’ve made a video to demonstrate the gameplay. 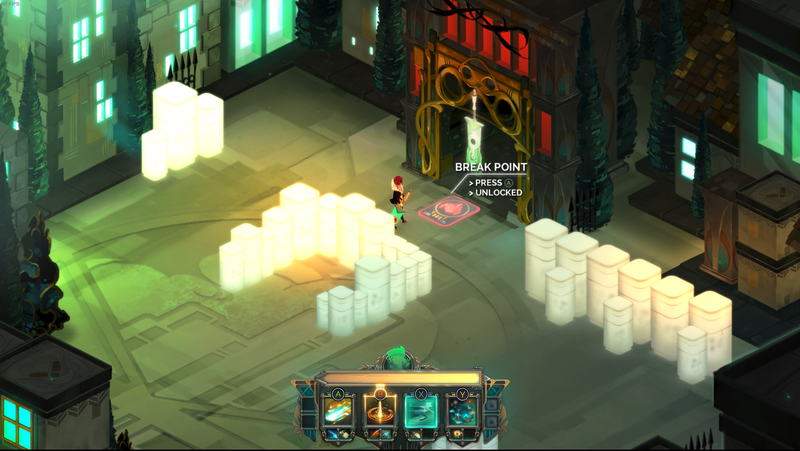 But you won’t be mashing any buttons in Transistor, thanks to its superpower, called Turn(). With Turn(), two things happen: first, time stops, allowing you to take stock. Second, any action you queue up while time is stopped will happen at super-speed when you exit Turn(). This means that, to your enemies, your movement is godlike. Moreover, it lets you teleport close to an enemy, drop a bomb, teleport away, then turn around and shoot the bomb, causing a huge explosion, all in the blink of an eye. Tactically, this is essential, as The Process is generally both much stronger than you, and much more numerous. Without Turn(), you’d have no hope of winning by the second fight. The only drawback to Turn() is that once you’ve used it, there’s a cooldown before you can use it again, and worse, while Turn() is in cooldown, you can’t use any Functions, bar Jaunt, which is your teleport Function. Fights therefore are often a game of tag - you use Turn() to get up close and personal, launch devastating attacks and combos, then teleport madly around the field of battle in real time, dodging attacks until Turn() is available again! 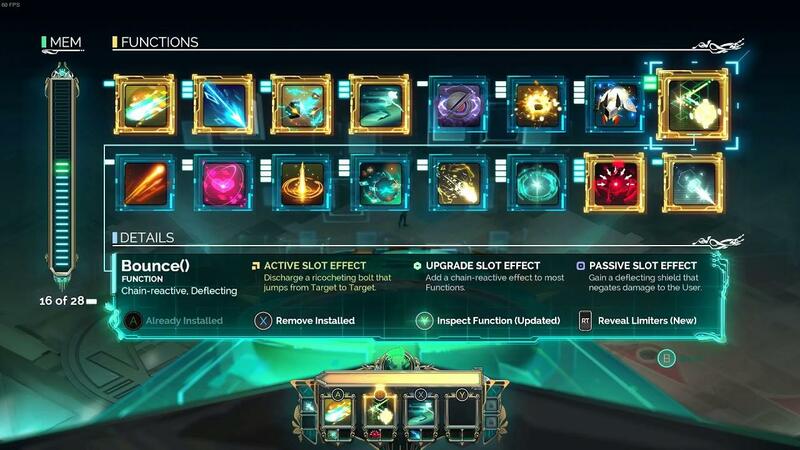 By the end of the game, you’ll have uncovered all 16 Functions, and with only those four base slots, this is where the real magic of Transistor’s tactics and strategy shines. You can place additional Functions into sub-slots of each of the four base slots, causing additional effects, depending on the combination. For example, one Function, Tap(), will add lifesteal to any other Function, often as a percentage of the damage dealt by the base Function. So, if you add it to your quick and dirty Crash() attack (50 dmg), it might be somewhat wasted. But add it to something powerful, like Load() or Cull(), and it can keep you topped up during the thick of battle. Or add it to your teleport Function, Jaunt(), and every time you jump, you’ll regenerate a bit of health. 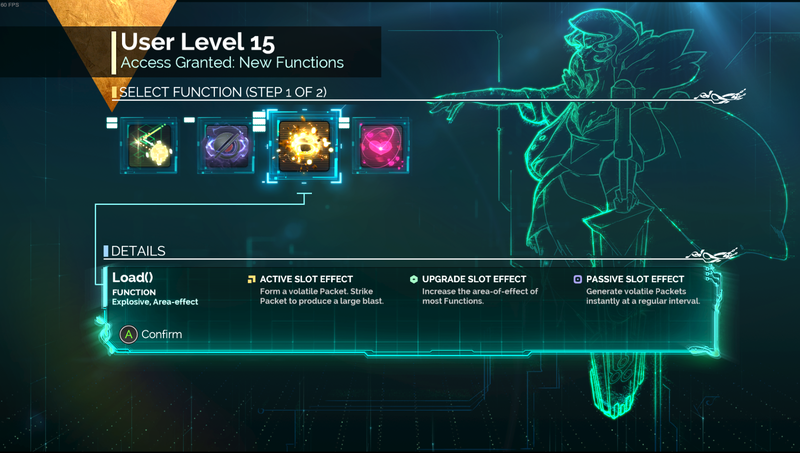 Functions can even be added to passive slots where they have yet more ways that they’ll influence the battlefield. Adding Tap() as a passive Function, for example, simply raises your base health. At at certain point in the game, you’ll unlock access to The Sandbox, which is a challenge area, allowing you to experiment against non-violent process “ghosts”, take speed runs, or tactical challenges in which you must defeat all enemies in a single use of Turn(). There’s also some plot reveals when you use the hammock, so it’s worth visiting the Sandbox whenever it crops up, even if you don’t want to test yourself against the challenge modes. If you’re finding the game too easy, you can also enhance The Process through a series of bad Functions which are called Limiters. The more Limiters you apply, the more experience you gain from each fight, but some Limiters are pretty brutal. In my playthrough, you might notice that when I kill any given Process, they spawn a “cell” which counts down to zero. If you haven’t picked up a cell by the time they count down, they’ll spawn into an entirely new Process which extends your fight. Collecting cells is normally just a case of running over them, but I had a Limiter in place which grants The Process’s cells a shield, which means I have to attack them before picking them up. Limiters are a great way to add a user-controlled difficulty curve, and rewards the player for stretching themselves against The Process. But they are also entirely optional and the game can be completed without using a single one. Speaking of completing the game, it features a really sweet Newgame+ mode which not only lets you keep all your Functions, but also extends the battle system by letting you unlock a further 16 identical Functions as you play and level up. This lets you load a Function twice - once as a core Function and once as an upgrade. There’s even an achievement for doing so! They also mock their own tutorial in this game mode, which is a nice touch. I can’t review Transistor without mentioning the music. As with Bastion, Supergiant Games have gone to town here, once again leveraging their in house specialist, Darren Korb. The music is atmospheric, beautiful and wonderfully integrated into every element of the game. It will change subtly when entering battle, again when you enter Turn() also distorting due to the time freeze, and you can enhance any moment of it by holding down the left trigger, which causes Red to hum along and a spotlight to shine on her performance. The Sandbox backdoor environment will also let you unlock all the music for playback at its jukebox. There are loads of other little touches that make Transistor shine. The game’s use of glow, birds that fly off when you approach, or the rarely used cutscenes. But that voice acting is what keeps things moving. The Transistor will comment that you’re going the wrong way with subtle remarks like “We’re heading back? Okay”. Or it will remind you mid battle that Turn() is ready again. It will also comment as you move past buildings or landmarks, enriching the city with a bit of history. The graphics too are stylish, consistent and memorable. The world of Cloudbank really is beautifully realised, even as The Process continually deconstructs it around you as the plot develops. 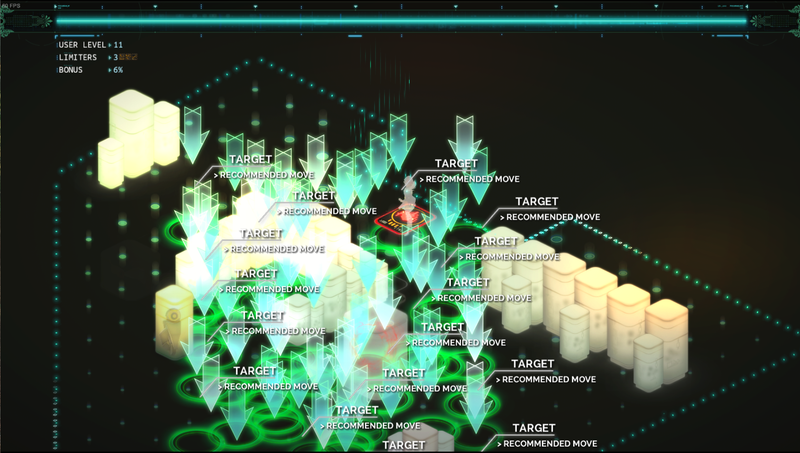 In fact, that last point is really one of the few downsides to Transistor. It’s about a city in crisis, overrun by The Process and being phased out of existence, one building at a time. And yet the city you’re exploring can often feel empty and lifeless, despite the vid terminals giving you a glimpse of the masses panicking as The Process attacks. The human action happens far from you as you battle The Process on otherwise empty streets, and I found the lack of ever meeting a single human being oddly disconcerting and a bit disappointing. I suppose technically, you meet the Camerata, but generally only to kill them! I also found it a little frustrating that you can only change the Transistor’s load out at the scattered Access Points. This is actually a game mechanic, since if you are reduced to zero health, you don’t actually die, you just start losing Functions instead and if you go on to win the battle, you can only recover those lost Functions at future Access Points. Even so, a little bit of leeway on that front would have opened up even more tactical play. In the same way, you can’t actually see how your Functions interrelate unless you remove them at an Access Point and then add them in again. This is only an issue as you start to play, since by the time you finish the game, you’ll be so familiar with each Function that you’ll know instinctively what each does. But it creates an early artificial learning curve when one shouldn’t exist at all. Finally, a technical issue. The game relies on an outdated Fmod component that doesn’t play very well with modern distros which feature more than one soundcard. This is such a shame, because Supergiant Games have really done well by us in the past, but it’s such a poor experience to download a game and have no sound out of the door simply because you have two sound outputs (in my case, an HDMI sound output to my monitor, plus of course my PC’s built-in analog card). To fix this, you have to run the game via terminal, which outputs each Fmod output and its corresponding index, then edit a text file in the game directory to match which output you want. In this day and age, it’s fiddly and unnecessary, but it appears that Supergiant Games aren’t going to address it in their Linux build, which is a real shame. Official fix and details here. I’ll be brief here. Transistor is stylish, polished, beautiful, memorable and satisfying to play. It’s great value for money at around 12-14 hours per playthrough and with that excellent NewGame+ mode to bring you back, you can easily double that number without getting bored. Play it now. I bought it right after finishing Bastion, but somehow haven't gotten around to playing it yet. Is it better with keyboard or controller? Couch or desk? Close-up monitor or far-away TV screen? This game is nothing but awesome. If you haven't played it, you need to Play it Now! @pb, played this with a keyboard and mouse and it worked well. Didn't try with a controller. The game is aesthetically very pleasing, but I just couldn't push myself to finish it. I guess I simply wasn't having fun. Couldn't say why exactly. On paper the game should be right up my alley. tuubi The game is aesthetically very pleasing, but I just couldn't push myself to finish it. I guess I simply wasn't having fun. Couldn't say why exactly. On paper the game should be right up my alley. I had a similar problem with my very first experience of Transistor too. I think I was just expecting more Bastion and it... isn't. Also, the depth of customisation didn't strike me on my first run and I was finding some of the battles extremely challenging. My second experience though was much more positive and I've completed this one around four times now. I just keep coming back to it. ShabbyX This game is nothing but awesome. If you haven't played it, you need to Play it Now! Thanks. I played Bastion with keyboard+mouse but I had a feeling it would be better with a controller. I'll probably try both ways with Transistor. Interesting comments about Transistor not being Bastion. I started with Transistor and loved it. Then, when I picked up Bastion i was disappointed, cause it wasn't like Transistor. Same same here, I've given the game several tries but just get bored and never finish it. Sure, the graphics and music is nice, but the game itself just isn't very interesting in my opinion. +1. I just couldn't play for long, I was not having fun and the sword was boring me to no end. I did play like half the game, so I gave it more than enough time. 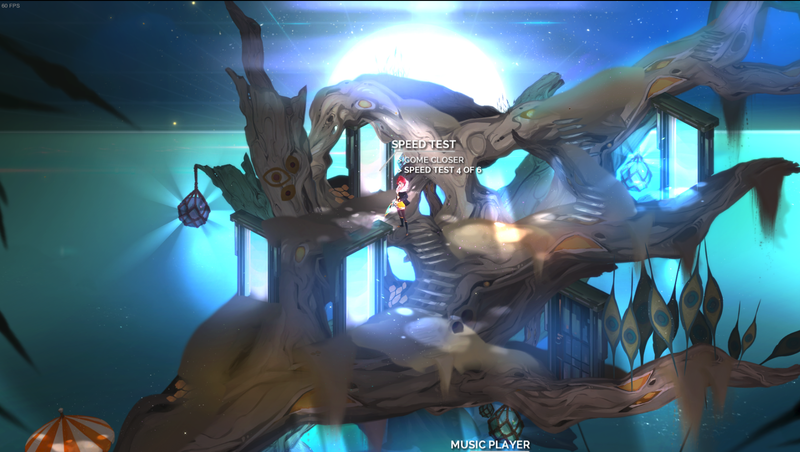 BTW, I loved Bastion and, by the looks of it, I should have loved this one too, but I didn't.